What Mint produces the coins? 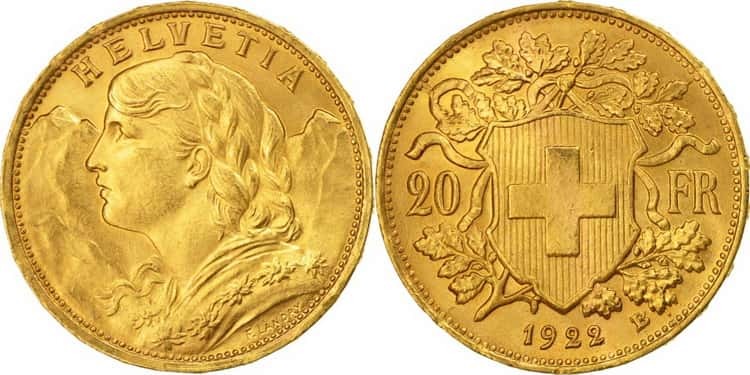 Vrenelli is the name of the gold coins of Switzerland of 10, 20 and 100 francs denomination, which was used primarily among common people. 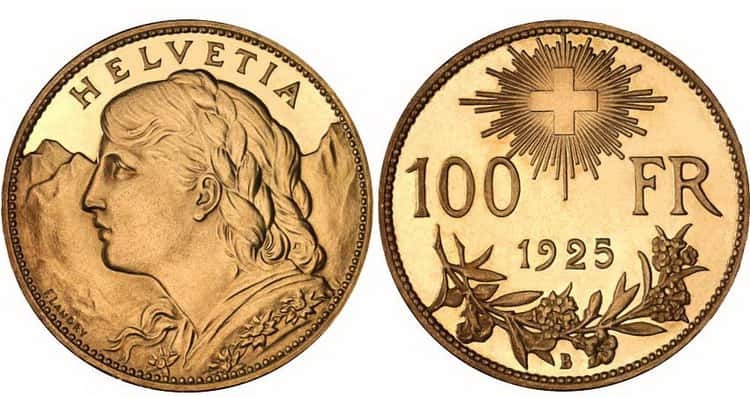 The name of the coin “Vrenelli” comes from the name of the Catholic saint Verena of Thebes, who became the prototype of Helvetia (“HELVETIA”) − the female personification of the Swiss Confederation. 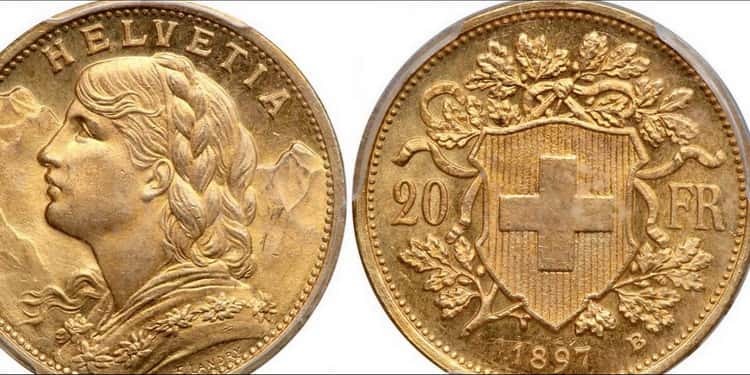 Golden Swiss francs of all denominations of the period from 1897 to 1949 were minted only as “uncirculated” and “uncirculated diamond”. Their circulation ranged from several thousands to several millions of samples. 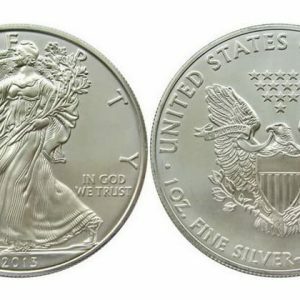 Coins with the smallest circulation are rare, therefore they are very much appreciated by collectors, and this increases their value on the market in several times. Obverse: In the center of the coin, the left side-face of a young woman is depicted. Her hair is braided at the top, and her shoulders are decorated with flowers. The portrait is engraved against the background of the Swiss Alps with the inscription “HELVETIA” above it. At the very bottom of the coin there is the special engraver’s stamp “F. LANDRY”. The edge of the coin is decorated with dots edging. Reverse of 10 and 100 francs: At the very top of the coin there is a symbolic cross in the rays of the sun. The denomination “10/100 FR” is indicated in the middle of the coin and the year of issue is placed slightly below. Blossom branches are engraved at the very bottom of the coin. Beneath them there is the stamp of the Mint “B”. The edge of the coin is decorated with dots edging. Reverse of 20 francs: In the middle of the coin there is a national emblem depicting a symbolic cross surrounded by oak branches connected by a ribbon. On both sides of it there are the denomination sign and “FR” together with the year of issue indicated just below. The stamp of the engraver “L” (Landry) and the stamp of the Mint “B” (Bern) are indicated on both sides of the year of issue. The edge of the coin is decorated with dots edging. The Swiss Mint is directly subordinate to the Swiss Federal Financial Office, which is part of the Federal Department of Finance. In 1901, the Swiss Federal Council decided to purchase land for the construction of the Mint, and the building began in 1902. 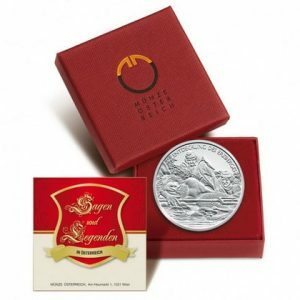 The official opening of the Mint in Bern was only on July 2, 1906, but the coins’ production began in May of this year. The building of the Mint, which was built on the basis of sketches by Theodor Gohl, is an object of cultural heritage of Switzerland. 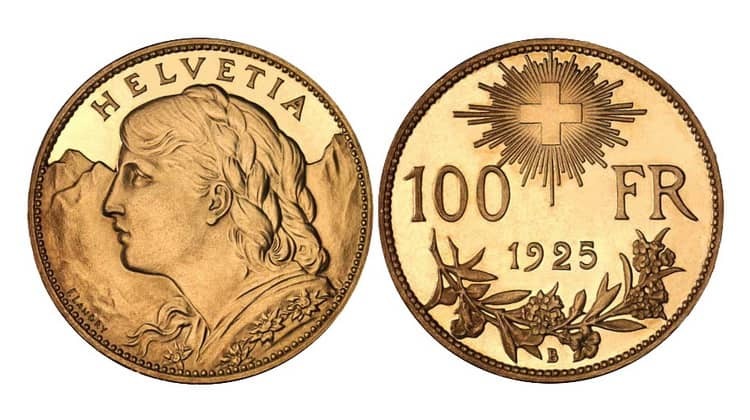 The first 100 francs coin issued by the Swiss Confederation was minted in 1925, during the period of Switzerland’s participation in the Latin American Monetary Union. Despite the fact that the circulation of this coin was 5000 samples, today there are only 3800 pieces left. Swiss francs were first issued in 1798 as the currency of the Republic of Helvetia, but after 5 years the Republic ceased to exist. Today Helvetia is the name of a region in Western Switzerland. At the same time, the Latin name of the Swiss state is “Confoederatio Helvetica”, and today the abbreviation of this name is used in the abbreviation of the national currency, license plates and even the name of the Swiss Internet domain (.ch). In addition, the inscription “Helvetia” can be found on some postage stamps. Switzerland borrowed the name of the national currency from France, which in the Middle Ages had a strong political and economic impact on the state. Today, the franc is the national currency of Switzerland only. Over the entire period of existence, a slight devaluation of the Swiss francs occurred only in 1936, and the reason for this was the economic crisis in the United States. Gold Vrenelli are exempt from VAT and capital gains tax in Switzerland. 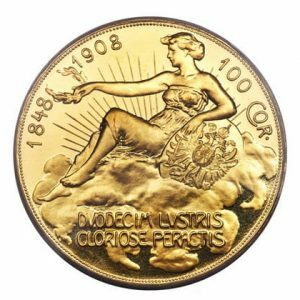 Switzerland minted gold francs of 20 francs denomination in the period from 1886 to 1949, but at the same time 10 francs were minted only during 1911-1922. Of these 11 years, 10 francs were not issued between 1917 and 1921 inclusive. That is why the 10 francs of 1922 is considered to be particularly valuable. The Swiss national emblem is a red shield with a large white cross. As a symbol of Switzerland, it was accepted in 1889. Now it is depicted on the national flag and national currency. Red and white colors are chosen for a reason and personify the independence of Switzerland. 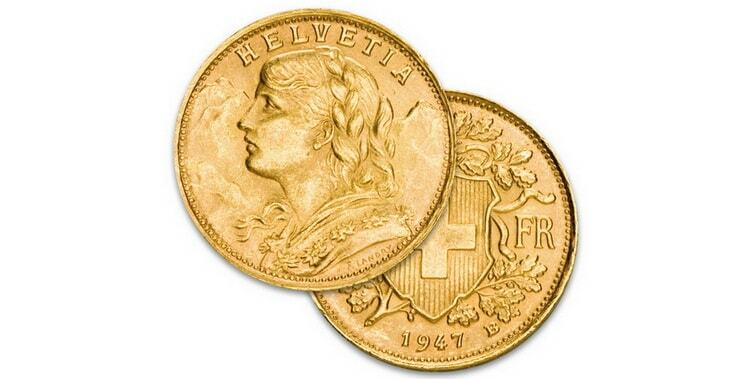 Golden Vrenelli are among the most popular collectible coins of Switzerland. However, There are the rare samples of these coins, which are called “Vrenelli with a curl”. 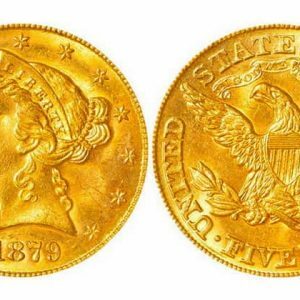 They were released in 1897 in the amount of several dozen as trial coins. But it was decided that such design would make the female image too frivolous, and such an option was refused. 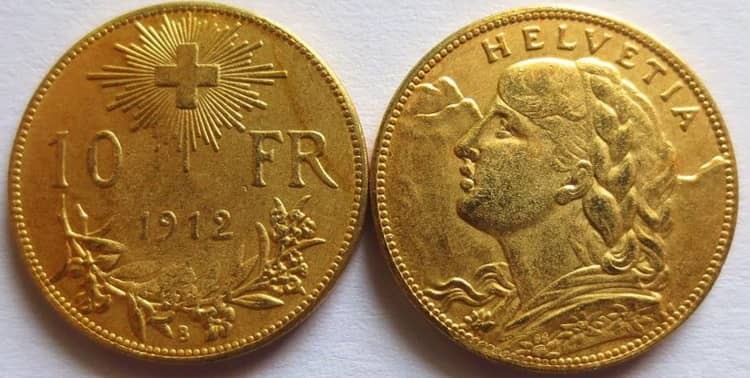 There are versions that part of the francs that were minted in 1945, 1946, 1947, and 1949 were made of Nazi gold, which at that time was kept in Swiss banks.